Travel inland, past Pietermaritzburg and through the Natal Midlands. At Himeville, in the Southern Drakensberg, transfer into a 4x4 vehicle to climb the steep and spectacular Sani Pass. In Lesotho, visit to a local Sotho village. 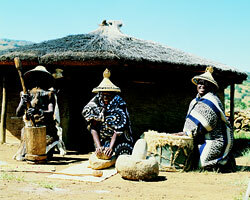 Learn about their traditions and way of life. Lunch at the highest hostelry (2844 m) in Southern Africa.